We are all used to seeing cedar apple rust, cedar hawthorn rust and cedar quince rust fungi on their dual hosts of junipers and Rosaceous hosts such as apple, crabapple, the occasional quince, and perhaps serviceberry in Ohio. 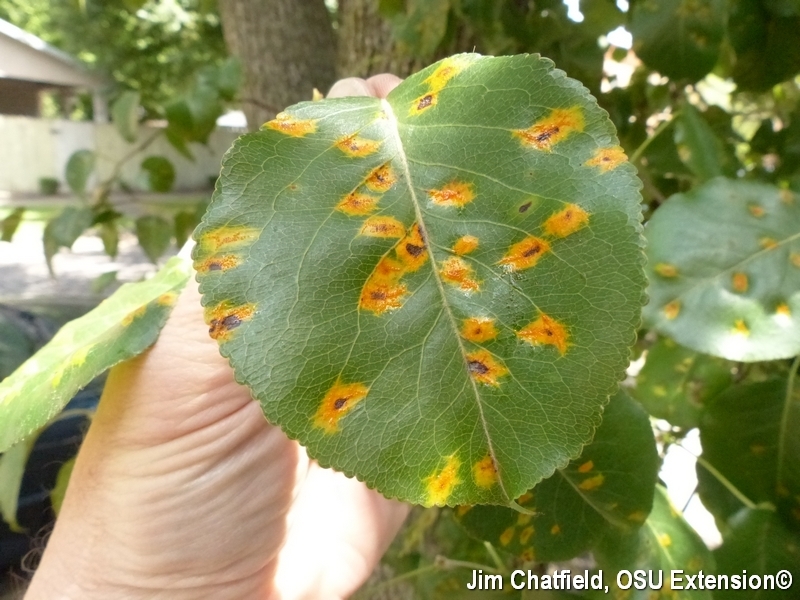 I was much surprised to see what I think are Callery pear trees speckled with bright orange-red rust symptoms in German Village in Columbus this past week, however. There is a European pear trellis rust fungus (Gymonsporangium sabine) which occurs in the Pacific Northwest of the U.S. and with some more easterly reports, but again I have not seen this and superficially this does not seem to be the rust that I saw here in German Village. Still puzzling this one: the tree does appear to be a pear and certainly this is a rust fungus. It has not yet reproduced sexually inside the leaf and thus the fungus is not emerging in pustules on the underside of the leaf, but we will follow this siting. One tree had leaves conspicuously speckled; several others had a lesion or two.